How would you like to raise some money for Overgate Hospice by taking part in the Mountain Bike Challenge on Sunday 18th June. This entry was posted in Elland, Get Involved / Have Your Say, June and tagged Health, Overgate Hospice. Quality For Health® is a quality assurance system developed by VAC specifically to support Voluntary and Community sector groups and organisations delivering local health services – and their funders – to clearly identify the difference they are making to their users through quality service delivery. VAC will be running a FREE training session ‘An Introduction to Quality for Health’ on Jun 6 between 10:00 and 12:30. This session is aimed at organisations delivering health and health related services who want to find out more about the Quality For Health® quality assurance system. 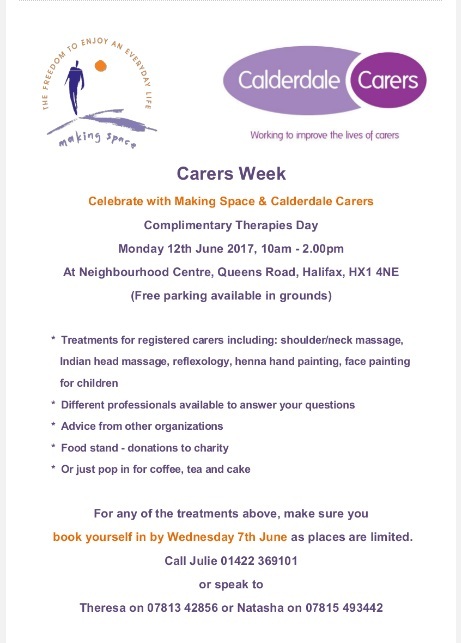 It will be held at their offices in Hall Street, Halifax. Further details can be found at http://cvac.org.uk/product/introduction-to-qfh/. 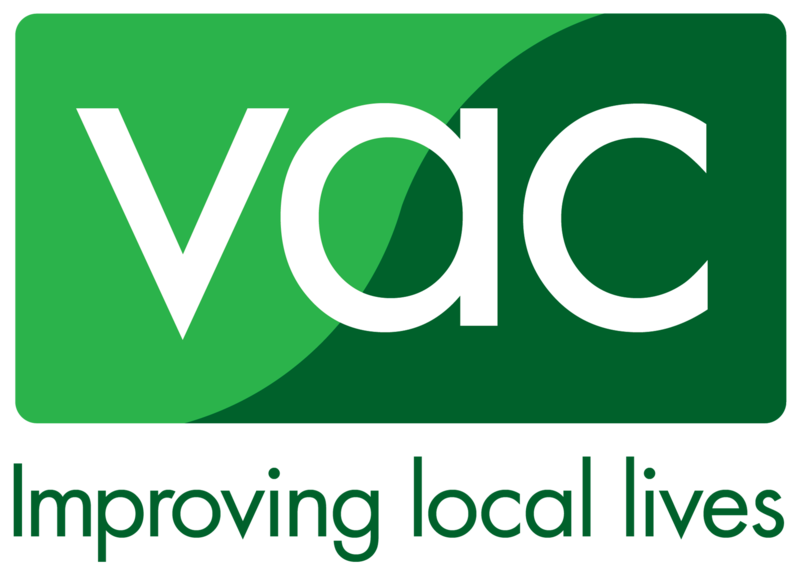 If you have any problems accessing the training via their website, please contact the training administrator on: training@cvac.org.uk or by phoning 01422 348777. This entry was posted in Get Involved / Have Your Say and tagged Health, June, Training, VCS Organisations, VCSE, Voluntary Action Calderdale. 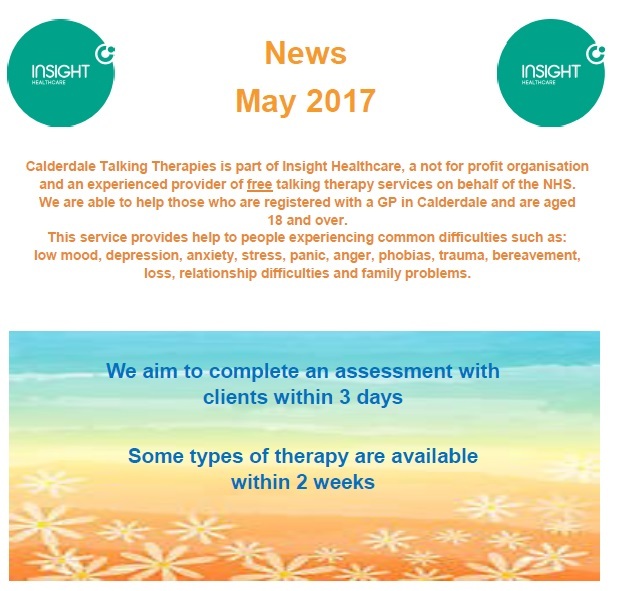 Calderdale Talking Therapies is part of Insight Healthcare and provide free talking therapy services on behalf of the NHS. They are able to help those registered with a GP in Calderdale that are aged 18 and over. The service provides help to people experiencing common difficulties such as: low mood, depression, anxiety, stress, panic, anger, phobias, trauma, bereavement, loss, relationship difficulties and family problems. They aim to complete an assessment with clients within 3 days and some types of therapy are available within 2 weeks. This entry was posted in Get Involved / Have Your Say and tagged calderdale, Calderdale and Huddersfield NHS, Health, Mental Health. 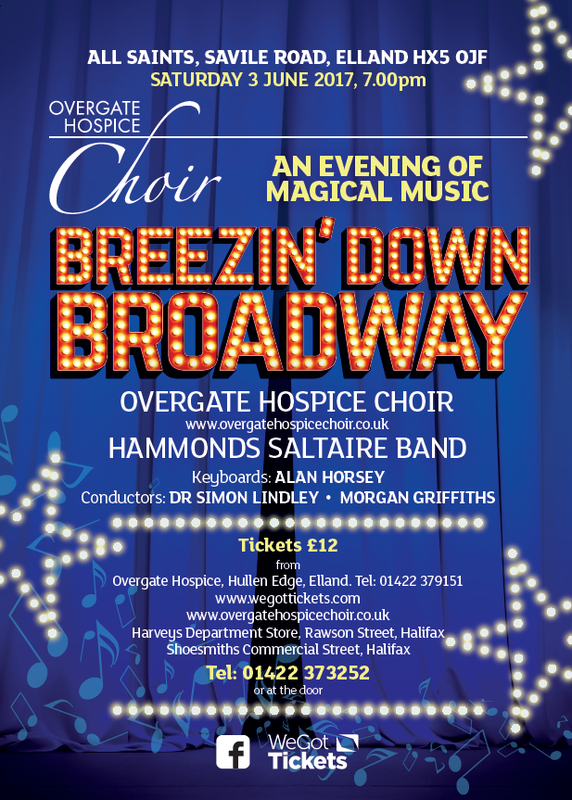 Join the Overgate Hospice Choir and Hammonds Saltaire Band for an evening of magical music – “Breezin’ Down Broadway” at All Saints on Savile Road, Elland Saturday 3 June 7:00 pm. Tickets are £12 and can be purchased from Overgate Hospice by calling them on 01422 373252. Tickets are also available from http://www.wegottickets.com, http://www.overgatehospicechoir.co.uk Harveys Department store or Shoesmiths in Halifax. This entry was posted in Elland, Get Involved / Have Your Say, June and tagged calderdale, Elland, Health, June, Overgate Hospice. FREE half term activities for ages 11+ return to Orange Box Tuesday 30 May to Friday 2 June between 2 pm and 4 pm. Get all arty in our arts and crafts sessions; beat your friends at table tennis; sing your favourite tunes with karaoke in the atrium; climb to new heights in our bouldering tunnel; see what you can do wearing a bumper ball in our zorbing sessions; and come help us celebrate the half term break with an end-of-week DJ party. This entry was posted in Elland, Get Involved / Have Your Say, Greetland & Stainland, Hipperholme & Lightcliffe, June, May and tagged Children and Young People, Climbing Wall, Crafts, Events, Get Involved, Get Involved / Have Your Say, Halifax, Health, Jun, May, Northowram & Shelf, Orangebox Young People's Centre, Sowerby Bridge. Overgate Hospice invite you to help us light up Shibden Park Lake by sponsoring a lantern, which will be floated on Shibden lake at sunset on 3rd June. You are welcome join them from 8:30pm for reflection and remembrance of loved ones at this special event. This entry was posted in Elland, Get Involved / Have Your Say, Hipperholme & Lightcliffe, June and tagged Health, Healthcare, lanterns, Overgate Hospice, Shibden Park. This entry was posted in Brighouse, Elland, Get Involved / Have Your Say, Greetland & Stainland, Hipperholme & Lightcliffe, May and tagged Calderdale Council, Halifax, Halifax Swimming Pool, Health, May, Staying Well. 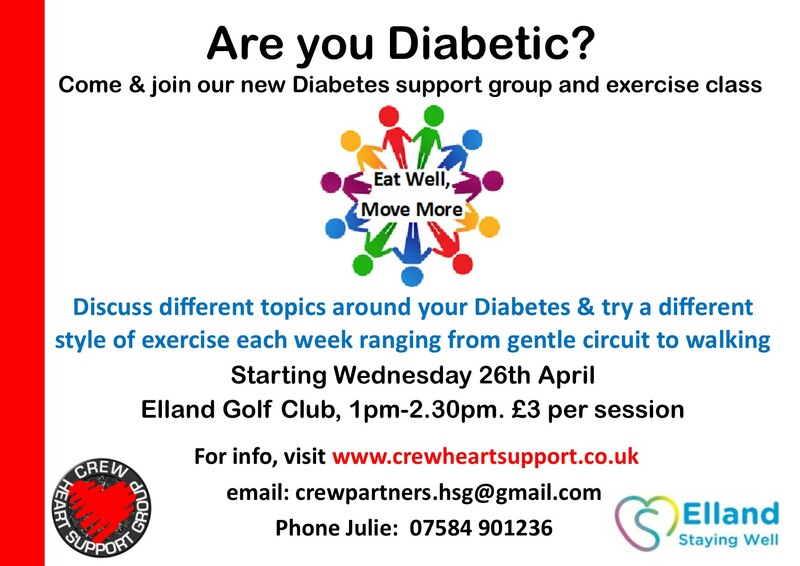 This entry was posted in Apr, Elland, Get Involved / Have Your Say and tagged calderdale, CREW Heart Support, Diabetes, Diabetes Support Group, Elland, Elland Golf Club, Get Involved, Health, News, Support, Support Group. From now until Friday 10 March, Yorkshire Smokefree Calderdale is offering free testing of people’s Carbon monoxide levels, every morning from 9.30am to 12 noon at the Laura Mitchell Health and Wellbeing Centre, Great Albion Street, Halifax. Carbon monoxide is one of the 4000 chemicals inhaled from tobacco smoke. It is a colourless, odourless and highly poisonous gas better known as a hazard given off by faulty gas appliances. The carbon monoxide test takes just a few minutes, and involves holding the breath for at least 10 seconds, then blowing into a monitor. This entry was posted in Get Involved / Have Your Say, Mar and tagged calderdale, Get Involved, Halifax, Health, Laura Mitchell Health and Wellbeing Centre, March, News, Stop Smoking, Yorkshire Smoke Free.